Keith Crook is a longtime faculty member at Portland Conservatory of Music and has taught classical guitar at the University of Maine and/or the University of Southern Maine since 1987. During that time he has also had the opportunity to teach most theory and ear-training courses offered at the undergraduate level. 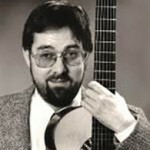 He studied guitar in Spain for seven years with Jose Luis Lopategui, Eduardo Sainz de la Maza, Luis Gasser and others. Keith holds a B.M. and Masters Degree in guitar performance. Besides periodic faculty recitals, he has been active as a soloist and chamber musician on the roster of both the New England and the Maine Touring Artists Program. Recently two of his guitar compositions and an article have been published in Guitar Review.